From the beautiful Himalayas in the north to the ever mesmerising temples in the south, from the beautiful Arabian Ocean and the deserts to the west and the humid deltas in the east makes India what it is today. The food, the clothing changes with every state in India according to their origin. The diversity of languages, tradition, food and culture are the main reason to the beauty of India. A wide range of food is available here. Every religion in every state have they own way of cooking with different spices and preparations. All Indian spices were chosen due to their medical qualities and to due to their own flavours. This research was done thousands of years ago by local self proclaimed doctors. But today those spices are known for their flavours and aromas. A well balanced Indian meal will always consist of six taste like Sweet, Sour, Salty, Spicy, Bitter and Astringent. India is well known for being a multi cultural country and hence is big on festivals that take place. Every religion has its own share of festivals that is celebrated by the whole family and friends of every religion. These festivals bring a colourful flair to the country. These festivals are celebrated for different reasons, either season change, community new year, A Gods birthday and etc. these festivals are followed by rich traditions which include saints and prophets to help them do it right. During a festival people clean their houses with holy water and decorate it with lights, colours and flowers & enjoy along with music and dance. Some of the Major festivals in India are: Diwali, Navratri, Holi, Christmas, Eid and many more. India is well known for its diversity in cultures. Compared to any other country India has maximum amount of religions and languages. The main religions in India are Hindu, Muslim, Catholic and Sikh. In Hindu there are more than 20 different casts. In Muslim there are about 4. In total India speaks over 29 Languages. The culture in India changes with every religion and hence a mix of these cultures is what makes the Indian culture different and flexible. Helping one another, treating guest as God and respect one another and elders are the main motto of the Indian culture. Folk Dance & Beautiful temples also make a major part to the Indian culture. A part of the country with the lap of Mother Nature. Experience the most beautiful untouched nature at its best. View the most beautiful Temples & other Architectural Monuments, The Calm Backwaters, Adventurous Wildlife, Ayurvedic relaxing massages, Folk Dance known as Kathakali, White sand Beaches and the Spirituality of this place. 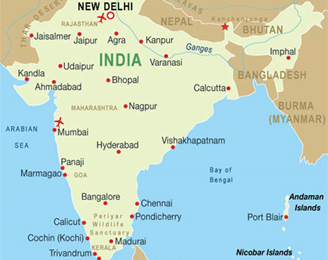 South Indian States: Kerala, Tamilnadu, Karnataka, Andhra Pradesh, Pondicherry, Andaman & Nicobar Islands, Lakshadweep Islands. Bangalore: Also known as Bengaluru and nicknamed as The Garden City. Located in the state of Karnataka. It is also the IT capital of the country and hence ranked as the "Beta World City". Bangalore has some of the countries well known collages, and research institutions. Some of the most Majestic, Mystic and Mesmerising destinations to tour. It has some beautiful attractions starting with the world famous & listed in the Seven Wonders of the World "The Taj Mahal", continuing to the sacred Ganges, the Luxurious Palaces and massive Forts, Monasteries, astonishing wild life, and the ever mighty Himalayas. Known for its richness in cultural Heritage. North Indian States: Rajasthan, Himachal Pradesh, Uttaranchal, Delhi, Uttar Pradesh, Jammu & Kashmir and Ladakh. Delhi: The Capital of India, Located on the North. They say there are no parties like the ones held in Delhi. Great of cuisines, heritage building, war monuments and the Parliament house are some of the tourist attractions. Divided into two half�s as Old Delhi and New Delhi and both are worth a see for their different cultures and structures. The long stretch of the Arabian Sea, The Rann of Kuch, Ajanta and Elorra Caves, wildlife sanctuaries, beaches and only of the most relaxed cultures is followed here. Known as a Visitors Paradise. Has the countries financial capital "Mumbai" within it. Also includes the state Gujrat, which is the home to the Father of the Nation "Mahatma Gandhi". The last and one of the smallest states of the western region, Goa. But definitely the most amazing youngster�s paradise. Western India States: Maharashtra, Gujrat, Goa. Mumbai: The Financial and Bollywood Capital of India. It is located on the west of India in the state Maharashtra right at the Arabian Sea. Very few people know that Mumbai is actually an Island. They say Mumbai never sleeps. Known for its great night life, celebrity craze, food, beaches and many more things related to entertainment. Mesmerizing Hindu, Buddhist & Jain Temples and monasteries with beautiful architecture which make a lovely pilgrimage region. Also well known for its beaches. During the British Calcutta located in West Bengal was the first announced Capital of India. Eastern India States: West Bengal, Bihar & Jharkhand. Calcutta: Located in West Bengal to the east of India. It Was the Capital during the British raj over India. Calcutta is well known for its strong hold in the Political culture due to its struggle for Independence. It has some beautiful monument structures for you to see like the Victoria Memorial, Fort William, Eden Gardens, The Howrah Bridge, Science City and many more. Platinumholidays.com specializes in cheap India Tours and affordable India Holidays. We offer packages to North India and South India, tours to Delhi, Jaipur, Agra, Ranthambore, Jhansi, Varanasi, Chennai, Mahabalipuram, Pondicherry, Tanjore, Trichy, Madurai, Periyar, Kumarakom, Cochin, Kerala, Munnar, and Kovalam. You will also visit famous attractions such as Taj Mahal, Red Fort, Humayun Tomb, Amber Fort, Hawa Mahal, City Palace, Agra Fort, the Ganges, Kapaleeshwar Temple, Meenakshi Temple, Gandhi Museum, and many more. Any type of tours to India we have it, this tours can be customized to meet your needs and they have connecting flights available from major cities in Canada. Plus our tours have Private Expert Guides and air conditioned vehicles.